How to be a Dwarf – And screw it up! The race has been a staple since the conception of the game, and they have a firm hold on our hearts. Along with the straight-forward things about height, weight, social interactions and where they come from, there are numerous game mechanics attached to Dwarves, some are plain, some are a little confusing. Here at Fail Squad Games we embrace screwing up and learning from it – so let’s take a closer look at the Dwarf. The race of dwarves typically dwells in hilly or mountainous regions. For details of the race in general the reader is refered to Advanced Dungeons and Dragons Monster Manual. 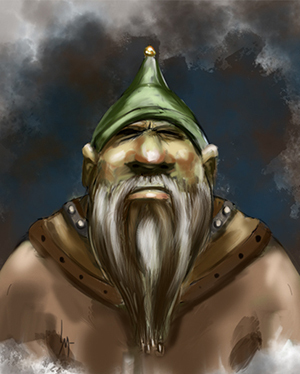 As player characters both dwarves, and their cousins “The mountain dwarves” can be considered. Why the sub-races weren’t immediately identified more clearly for PCs as was with halflings is anyone’s guess. We looked at level and statistic limits on races in previous posts so a good deal of that is glazed over here. To sum up, dwarves may Multi-class, and have limits for all classes but Thief. Dwarves are non-magical by nature and hearty when it comes to poisons and toxins. They have the very powerful benefit of gaining a +1 to those saves for every 3.5 points of constitution. They begin the game knowing SIX languages! But may only ever learn two more throughout their adventuring career. This makes dwarves ideal adventuring partners underground and anywhere. Most of the time that I have personally screwed up being a dwarf has been in forgetting all the various abilities granted to the race while in the heart of an adventure. The Monster manual is a little more help on the clan society of the dwarves. If you keep the numbers and benefits above in mind, you’ll do just fine. There are a lot to remember though. To me personally, I think of them as stubborn to change, slow to make friends, but the most loyal once there. I think of curmudgeonly, gruff, hard workers who pride themselves on craftsmanship and patience, but have a lust for gold and practice a conservative hoarding of wealth. This view changes a bit more when it comes to Tolkein and other inspirations for the race. What doesn’t change is their comfort under the mountains and mining the tunnels. This is a universally agreed upon trait of the dwarf, as is their love of ale. Adding a dwarf as any class to an adventuring party is a definite asset. typically they show up as Fighter / Thieves and excel at the combination. It might be time to revisit the dwarf if you haven’t played one for a while. Who are some of your favorites? Dwarves can’t dual class. They multi class. I always liked dwarves as a race of tough and capable adventurers. I never understood the no Cleric or Paladin thing. They seem to be these very traditional and community oriented people, “For Clan Battlehammer and Moradin!”. Love me some Dwarven Fighter/Cleric. I agree, the no cleric especially just – bothers me. I go all UA on that rule and allow it.